This is the best part of my job! 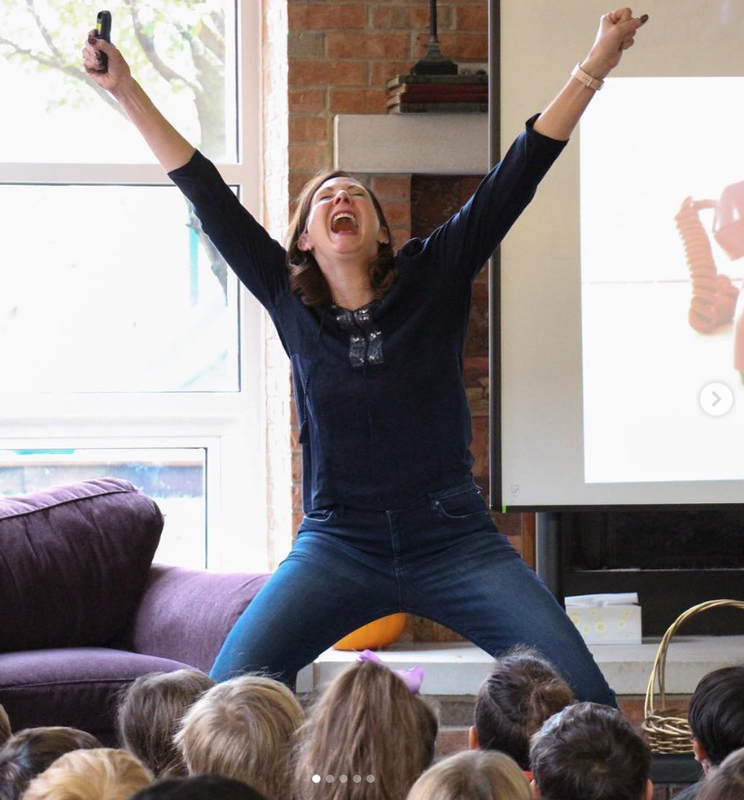 I make my school visits what I would have enjoyed as a young child: fun, fast- paced and visual! Using an audio/visual presentation with lots of opportunity for interaction, we learn how an idea becomes a book. But, more importantly, we learn about the MAGIC power of books, how important reading is and how life-changing books are. (I promise, I convey the message in a super-fun, kid-friendly way!) 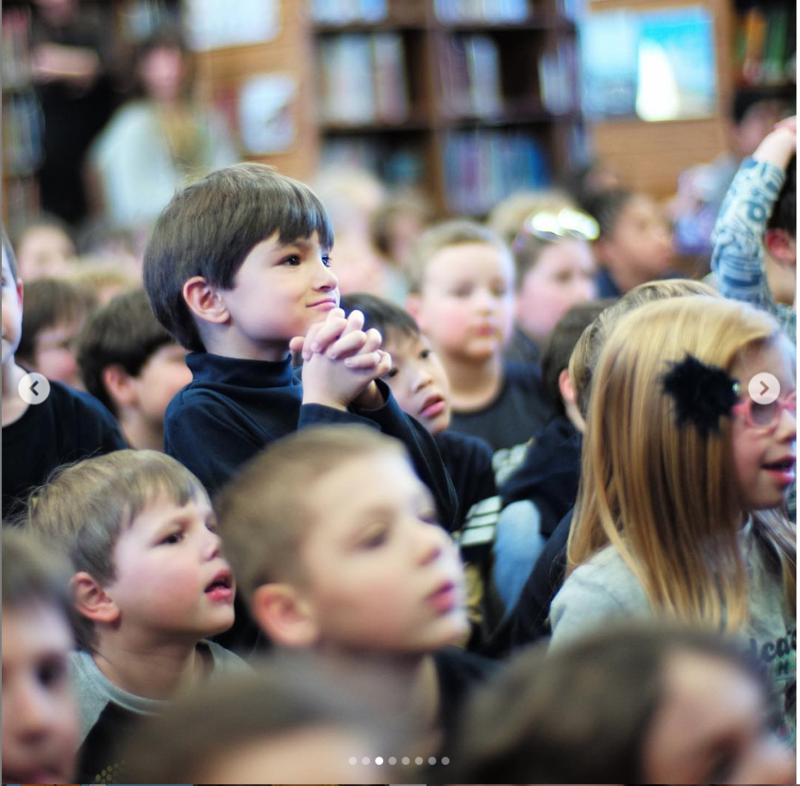 I aim to leave kids feeling energized and excited about reading! It’s fun to get silly with the kids! Grades K-4: The length of my presentations varies from 45 minutes to an hour, depending on your schedule needs, the time allotted for interaction and Q&A, and on the attention span (i.e. age) and size of the group. Grades 5-8: I have a specific a/v presentation geared to this audience. Preschools: I modify my presentations for preschools, and typically don’t utilize the a/v presentation. I do a short introduction, talk a little about how I became an author, do a reading with a little help from my audience and try a little Q&A. These are short, lively presentations, and I’ve done as many as 11 in a day (! ), working my way through the classrooms. I really enjoy this age group, their unpredictable questions and comments and our occasional need to work out our wiggles! Adult Audiences: I often present to groups of teachers, librarians and literary enthusiasts. If you think I might be a good fit for your school or organization, contact my booking agent, Janit Ramos at janit@sherririnker.com. She will be happy to email you information about pricing, scheduling the day and the number of presentations, and discuss available dates. Captivated fans enjoying Sherri’s presentation. To economize, I'm happy to be "shared" with a nearby school, whereby you can split the cost of my day rate and, if applicable, travel expenses. I don't require a pre-sale of my book, but I'd be thrilled if you offer one! It's nice if students are familiar with my book prior to my arrival. I think it makes it more fun for them. CLICK HERE to download a prep sheet for my visit! Skype Appearances: If you are unable to have a school visit with me, you can arrange for a Skype visit with me. I usually do the sessions in the morning and I can do a maximum of 4 sessions a day (45 minutes maximum in length.) I do require a technical check, the day before to make sure everything is working properly. Please contact my booking agent Janit Ramos at janit@sherririnker.com for availability and pricing.